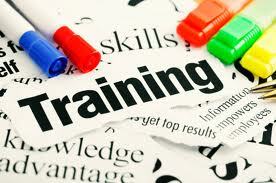 I have been asked to do some training next week. I have been busy writing up the session and doing a powerpoint presentation along with organising a few exercises and an ice breaking game. The usual set up for any training session that I might be given. I found out (quite by accident) that there are two people who are participating in the training session who have a disability. One of them is blind and the other is visually impaired. 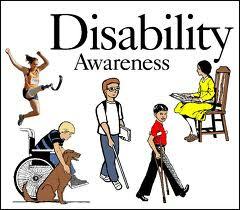 I have held training sessions with Receptionists on how to assist people with a disability but I have never actually held a training session with anyone that has a disability. I volunteer with a local disability group and have learnt to have a good understanding of their needs. So hearing that these two people were attending my training session made me completely re think my training schedule. What did I change and what am I going to do differently? I had planned on doing an icebreaker that involved everyone standing in a circle and using a ball of wool – well that cannot be done now so I have arranged to do another icebreaker. Not a problem to change but it would have been a big problem had I arrived unaware of their disability and only had that exercise with me. I have written another exercise that enables the whole group to take part in. I will make sure that I stand within a short distance of the two ladies ensuring that they are comfortable and able to hear the others in the group as well as myself. I will also ensure that on the morning of the training that people outside of the training room are informed that noise should be kept to a minimum, as we need to keep distractions down to a minimum. I will make every effort to talk to the group rather than taking in different directions that can sometimes happen. There is one exercise that involves reading and completing an exercise. For the visually impaired lady I have taken the time to find out that with a magnifying glass she can read print of 16 so I will get her one printed out at that size. For the lady that is blind she has a fantastic computer that reads things to her. When she receives an email the computer will read it to her and she can dictate a reply and the computer will type it and send it. So I have spoke to her and said that I will email her the exercise before the training session so she can have it read to her. On the day of the training I had planned on everyone doing the exercise individually, but I now plan to put people into pairs so the two ladies will have support if needed. I feel happier that I have all of these plans set out. But it could have been so different had I not been aware that they were doing the course. I usually indicate how many I will like in the session and just turn up. This training session has definitely made me more aware and in future I will be asking if there are any people with special needs taking part in the group and ensure that my training is taking their needs into consideration. These are signs that you should have placed around your Surgery or place of work. Familiarise yourself with them and what they mean. 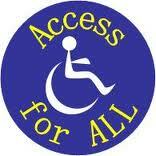 REMEMBER they are to help people with a disability and should not be used or abused by able-bodied people. There are many different signs that you can used. They come in many sizes and colours – but the most important thing is that the person that the sign is intended for is easily seen and placed in the appropriate places. Here are the some of the favored signs that you will see in all public areas. 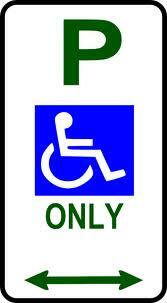 This sign can be displayed in several places, from the main Reception area to the disabled toilets. This lets visitors/patients know that your company have a hearing loop on the premises. Make sure you know where it is kept and how to operate it. This should be checked on a regular basis to ensure it is working correctly. 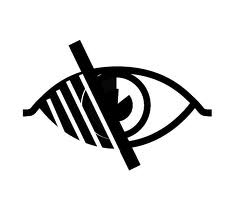 If a visitor/patient has a sight problem and identifies this please inform the person that they are going in to see so they are aware. Ask if they need assistance – especially when it comes to filling out any forms. If your company has a website does it have a facility for larger print for the visually impaired? Only guide dogs are allowed into a Surgery. Try not to district the guide dog or allow people to crowd around the dog or the patient. Your Surgery should have designated parking spaces for disabled people. These spaces must be for these people alone. 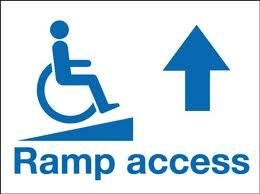 If your place of work has steps you should have a ramp for wheelchair users, and others that would find using steps difficult such as the elderly or people with pushchairs. Ensure that you have a sign displayed clearly. You will usually find these signs in larger buildings such as hospital or Government buildings. Some Health Authorities run courses on basis sign language for Doctors Receptionists to attend. Important: A disability is not always visual.